Bed time in our house has always been stressful, always been a battle and the girls fight until gone midnight every night. It has been the same for almost 5 years. We do have a routine and we had tried every recommendation but nothing worked. Nothing could break the screaming and the tantrum or the general messing around. This week something has changed and I know that by writing this post that I will jinx it but oh well. Since returning from Britmums the girls are going to sleep in their own beds without me sitting in their rooms with them. That is a huge achievment. 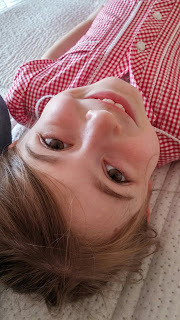 My eldest seems more content that I am not with her sister first, as she usually does less messing and falls to sleep quicker, and so goes to sleep. I am not saying there is no playing up, of course there is they are children after all, but the playing around is minimal and for the past few nights I have had both girls asleep within an hour of them getting into bed. I haven't really done anything different same routine and same bed time. The thing that changed is the night I returned from Britmums my youngest said she was tired and wanted to go to bed. I put her in bed gave her a kiss and said night and that was it. My eldest played up quite a bit that night to the point where I took to twitter to say stop now enough. It was the only place for me to scream [I know online and it doesn't really count]. After that though they both seem to be getting used to me not sitting with them. It hasn't been easy for me, I miss their cuddles and I miss stroking their hair as they fall asleep. It serves as another reminder that they are growing up far too quickly. On the flip side, bedtime is much more peaceful and a lot less stressful. I hope bedtime continues to be as peaceful.